The consignment of fillies from Juddmonte Farms is always one of the highlights of the Tattersalls December Mare Sale and they did not disappoint, realising 1,848,000 guineas for the 24 lots on offer. Trade on the third day realised 5,257,800 guineas for the 205 lots sold, at an average of 25,648 guineas and a median of 10,000 guineas. 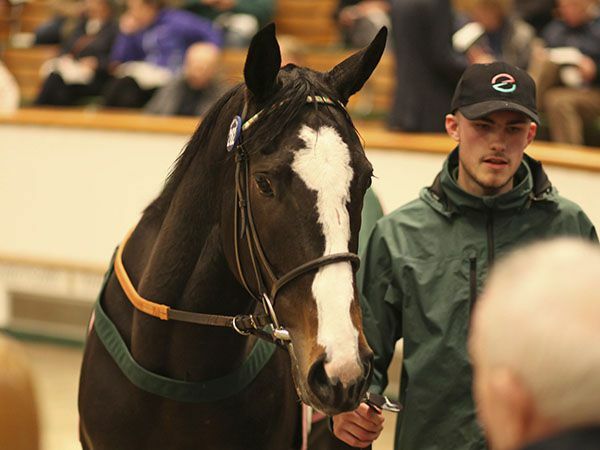 The session-equalling top lots were two fillies from Juddmonte’s draft who realised 400,000 guineas apiece whilst their fillies filled four of the top five prices for the day. Roger Varian had to go to 400,000 guineas to secure the three-year-old DUBAWI filly SUPPORTER on behalf of Nurlan Bizakov's Hesmonds Stud. The daughter of the EMPIRE MAKER mare VERY GOOD NEWS is a half-sister to the Group 1 Irish St Leger third WEEKENDER, whilst the second dam is the amazing broodmare HASILI, the dam of the Group 1 winners INTERCONTINENTAL, CACIQUE, CHAMPS ELYSEES, HEAT HAZE and BANKS HILL. "Hesmonds is a young farm for Nurlan and he is building up a strong broodmare band," said Varian. "It is a fantastic farm and is just starting to be successful in Nurlan's ownership. "Nurlan has had a good year with some nice horses, especially some two-year-olds who could have Classic campaigns next year – for instance, Tauteke, a daughter of Sea The Stars who won her novice race at Chelmsford last week, while Qazyna is a daughter of Frankel who won a Listed race on her last start for us this year. "She is a three-year-old and will stay in training at four – she is a big filly and should only improve." Bizakov purchased Hesmonds Stud in 2010. US owner-breeders John Gunther and his daughter Tanya secured the DANSILI filly WEEKDAY for the session joint top price of 400,000 guineas. They landed the Juddmonte-consigned daughter of the Group 1 Falmouth Stakes winner TIMEPIECE after seeing off Rabbah Bloodstock’s Jono Mills. "She is a lovely filly and from a very good family," said Gunther, who was standing with his daughter Tanya, who signed for the new acquisition. "There are also a couple of Dubawi younger siblings to run for the mare, which was important to us they could add again to the pedigree." It wasn’t the first time the pair had topped proceedings on this day, having purchased POSSET from the same draft back in 2014 for 625,000 guineas. 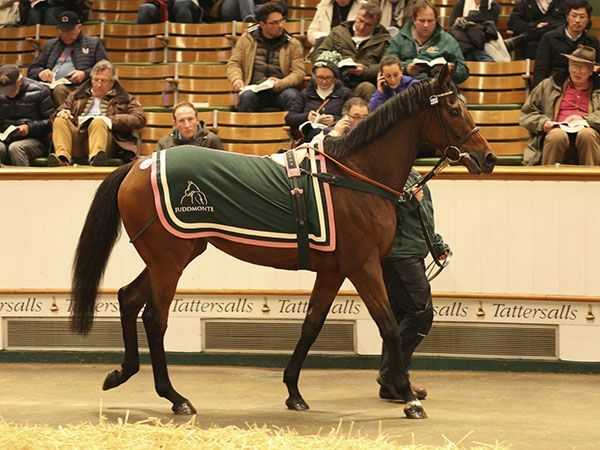 Her GALILEO colt sold for 1,100,000 guineas at Book 1 of the Tattersalls October Yearling Sale this year. Gunther, who was standing in the bidders' area by the sale ring exit, added: "I have had luck before buying from Juddmonte - Without Parole is from a Juddmonte family and I said this morning that I was not going to leave town today without buying one from Juddmonte! "I stood in this spot when I bought Posset - it has been lucky." The Gunthers have enjoyed a remarkable year as the breeders of US Triple Crown winner JUSTIFY and the owner-breeders of Group 1 St James’ Palace Stakes winner WITHOUT PAROLE. US agent Justin Casse secured another Juddmonte offering when he went to 175,000 guineas to land AT YOUR PLEASURE, the WAR FRONT daughter of the multiple Grade 1 winner VENTURA. Casse purchased the three-year-old filly on behalf of Haras D’Etreham’s Nicholas de Chambure. "Nicolas and I agreed that she is a beautiful physical – she has a great shape and she has a good walk," said Casse. "War Fronts are very popular in the US – this family is a nice US family – and she could end up there. It is good that she is a winner." VENTURA is the winner of ten races for Juddmonte, including four Grade 1s including the Santa Monica Handicap, the Matriarch Stakes, the Woodbine Mile Stakes and the Just A Game Stakes. Rabbah Bloodstock’s Jono Mills struck to secure the Juddmonte Farm’s three-year-old REKINDLE for 170,000 guineas. 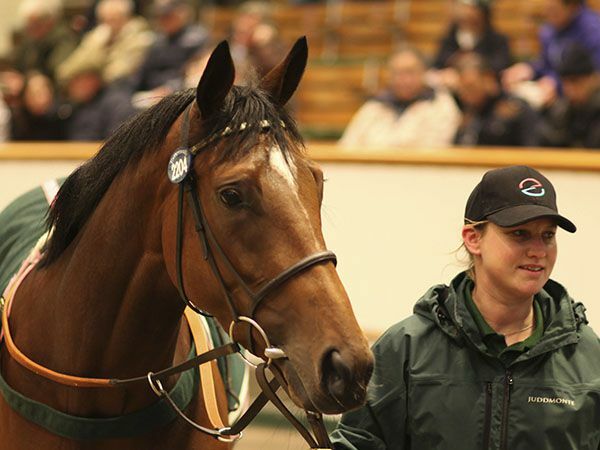 "I am very glad we have got her," said Mills about the unraced daughter of FRANKEL. "The family is only going to get better and better, hopefully there will be plenty of updates to come - it is just such a lovely page. We have not made any plans yet." REKINDLE is the first foal out of the young PIVOTAL mare HOT SNAP, winner of the Group 3 Nell Gwyn Stakes and placed in the Group 1 Nassau Stakes. She is a daughter of MIDSUMMER, the dam of the wonderful race mare and champion MIDDAY, and the family includes such names as ELMAAMUL and REAMS OF VERSE. HOT SNAP has a 2016 colt by FRANKEL, a 2018 filly by GALILEO and she was covered by INVINCIBLE SPIRIT this spring. 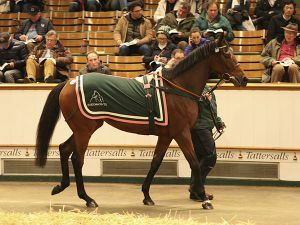 Late in the evening Avenue Bloodstock’s John Ferguson went to 190,000 guineas to secure the DUTCH ART filly MUSICAL ART. The three-year-old filly was third in the Group 3 Princess Margaret Stakes for trainer Paul Cole and owner Mrs Fitri Hay and is out of MUSICAL BAR, the BARATHEA half-sister to the dual 1,000 Guineas winner FINSCEAL BEO. 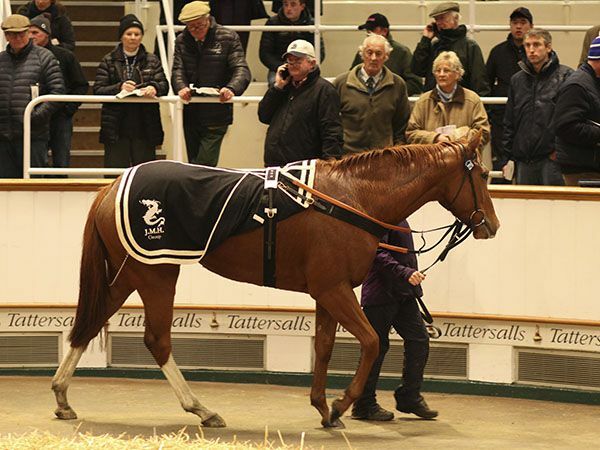 The Tattersalls December Mare Sale continues at 9.30am on Thursday, December 6thwith the fourth and final session.